‘The Influence of Furniture on Love’, along with the exhibition ‘Hey, I’m Mr Poetic’, staged at Wysing Arts Centre between April and June this year, are both pauses to reflect on the institution’s 35-year history. Although Wysing has an exhibitions and events programme coordinated by in-house curators, and on-site studios and specialist workshops, over the decades a remarkable tally of artists – a veritable who’s who – have passed through the retreats and residencies programmes. Wysing’s institutional remit of process and production lends it a refreshing autonomy that distinguishes it from other exhibition-oriented venues across the UK. That it is loved and appreciated by artists both regionally and nationally is unsurprising. Together, these exhibitions represent a selective survey of those who have stayed at the rural Cambridgeshire site over the years. ‘Hey, I’m Mr Poetic’ was presented in the public gallery, while ‘The Influence of Furniture on Love’ was staged in Wysing residency artists’ lodgings, a 17th-century farmhouse – the first time it has opened to the public. Making the private public, and how to live and work together, are among themes addressed by ‘The Influence of Furniture on Love’, a title taken by Wysing curator Lotte Juul Peterson and artist-curator Giles Round from an unpublished essay by the economist John Maynard Keynes. In this essay, held by the University of Cambridge, Keynes discusses whether it is possible for the rooms in which we live to ‘suggest to us thoughts and feelings and occupations’. The farmhouse is an intelligent setting for this exhibition, returning the domestic living place, a scene of sociality – albeit temporary – with the manifest place of work: the gallery. It implies a sinuous network of relations beyond Wysing itself, and that somehow the exhibition’s absences, its partiality, linger on. (Concealed at the end of the farmhouse, a house within a house, is the caretaker’s residence.) Included among the 19 exhibiting artists in ‘The Influence of Furniture on Love’ is co-curator Round, Céline Condorelli, Gil Leung, Neal White, Philomene Pirecki, Phil Root and Mark Aerial Waller, along with two Turner Prize winners: Laure Prouvost and Elizabeth Price. While there is no pretence to representativeness, the selection is weighted towards already-visible, mainly London-based artists, leading me to speculate about those who are absent. So this speculation on the affective influence of rooms, inhabitants and their objects is a prescient imponderable for viewers of this exhibition. It is also prescient, although I doubt they would couch it in such language, for the Cambridgeshire ghost hunters who, since the exhibition opened to the public, have harried Wysing to spend the night in the farmhouse which, rumour has it, is haunted. Timbers used to build the house’s frame are reputedly from ships salvaged following the sinking of the Spanish Armada. To enter a house is to start on an enforced choreography. 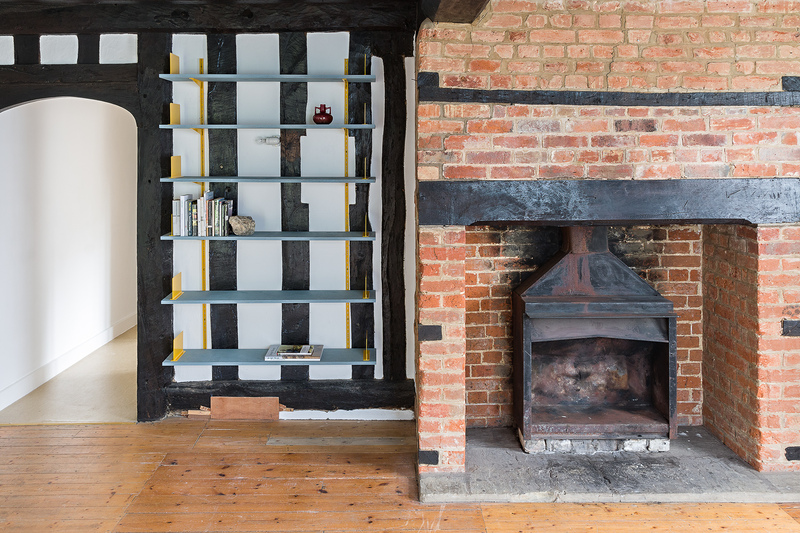 At the kitchen entrance, works by four artists – Round, Provost, Condorelli and The Grantchester Pottery – frame the continued movement through wonky corridors, modern bathrooms, an 18th-century porch, and five bedrooms, offset by black beams and white wattle-and-daub panels. Upon entry, placed proudly on the kitchen table are Grantchester Pottery glazed stoneware objects – cloying, too-tasteful coffee pots, not for handling. But surrounding them are counterpoint works that add complexity to the somewhat fatigued art-craft-design conversation. On a shelf above the stove a small dipped porcelain bowl by Condorelli accompanies a copy of, and a reproduced page from, James Langdon’s book A School for Design Fiction, an entreaty for speculative objects, ‘in the same register as science fiction’, that cannot presently be made. To the left and right of the work surface, hidden among other domestic appliances, are two ‘as found’ works by Round: a La Cupola espresso maker and an Ettore kettle. The former, titled oblique forgetfulness (For Aldo) (2014), and the latter, titled fill up forever on 4-star fuel… fill up my veins & set them alight (for Ettore) (2014), imply a reflexive generational influence, while recalling Ettore Sottsass’s responsiveness to the emotional and cultural states of objects he accorded to their functional requirements. The house itself, its structure on show, concertinas time in an ad hoc way that relays and returns between it and the objects on display. Discretely, to the side of the kitchen door, is the first of many of Prouvost’s ‘fake signs’ (2014) throughout the house, each with their own apparently site-specific text. ‘ideally this room would be loved’ reads the kitchen sign, painted in trompe l’oeil to give an illusion of wooden volume. The illusionism of these signs – paint pretends to be wood – is a fascinating counterpoint to the ‘as found’ literalism of Round’s appliances, and the tactile materiality of ceramics. It dramatises the relationship between the old and the new, depth and surface. This category confusion, one-thing-as-another, is played out to great effect throughout the exhibition, but nowhere more effectively than in Price’s G.U.N. (1993). Installed in a large, empty room upstairs, it consists of a blank-firing facsimile gun placed atop a chest of drawers stripped of handles. This is not a defunctionalised chest of drawers, but a hollow fabricated sculpture modelled upon a chest of drawers. Somehow this is more haunting than the implied macabre narrative. Throughout the farmhouse certain objects have selectively been allowed to remain. Juliette Blightman’s radio that periodically plays Sailing By (2010) in the bathroom is accompanied by a coffee cup that could feasibly just be there. I checked the toilet, half expecting it to be dry. In the front room a piano stands beneath framed sheet music in Cally Spooner’s Seven Thirty Till Nine (2012). At the exhibition’s opening a pianist performed the music, singing ‘labour’ in place of ‘love’ each time it occurred. Is the chair by a record player loaded with Seb Patane’s sound collage, Evening (Featuring James Beckett) (2014), to be sat on? While in one room, William Morris curtains hang unattributed among works by Ruth Beale, Ben Brierley, Root and Waller. Room 4 was charged with an oneiric quality. A television displaying Waller’s episodic dream narrative, Time Together (2013), gazed over a desolate room in which only a stripped wooden-framed bed remained, and, discretely, a mousetrap. At the head of the bed, Jessie Flood-Paddock’s enlarged objects and primitivist totems reigned; at the foot, Pirecki had partially painted the wall in machine-mixed and eye-mixed emulsions, as if in a state of un-paintedness. Among such a quantity of things, a framed newspaper cutting from the Independent in 1987, by Beale, takes us back to Keynes’s question. The clipping shows a photograph of Edmund and Ruth Frow in their front room among 15,000 rare books. The couple, a former toolmaker and a retired teacher, are just weeks away from moving to a flat, with their library, to the then new labour movement library in Salford. With the library deposited in a purpose-built space, the couple would return to domestic order. It addresses the politics and aesthetics of placing the private in public display. Who knows what thoughts and feelings presented themselves to the elderly couple, separated from their library?